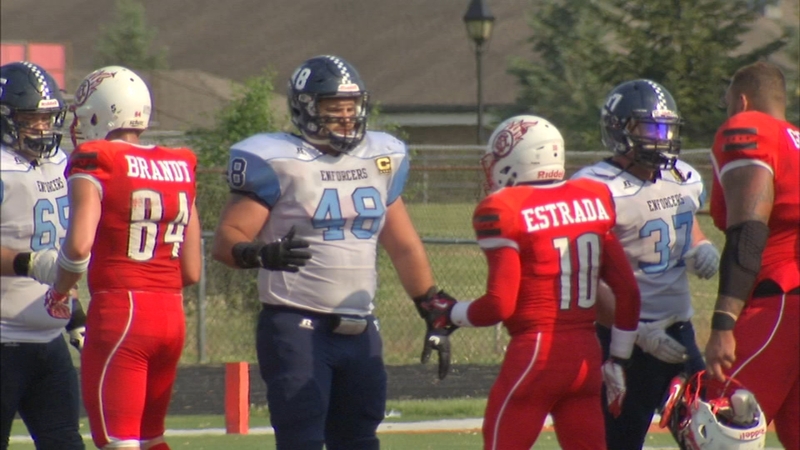 Chicago's emergency personnel honored two fallen members with the annual First Responders Bowl on Saturday. There was no lack of passion on the field at Brother Rice High School as the Chicago Police Department's "Enforcers" faced off against the Fire Department's "Blaze." "We want to win. We owe them because they took it last year," said firefighter Randall Maxie. The annual event, now in its eighth year, is meant to raise money for charity while honor each other's dedication and sacrifice. This year's face-off took on added significance as both the police and fire departments have sustained painful losses recently. First, police commander Paul Bauer was shot and killed in the line of duty in February as he chased a suspect inside the Thompson Center. And just last week veteran fire department diver Juan Bucio died after searching for a missing boater in the Chicago River. The Chicago Fire Department's Katie Howard-Hitz said the sense of loss has made her feel closer to her brethren in blue. "For both of us to lose someone in the line of duty the same year, I feel like we're here and we're playing a game, but we're family. Everyone's one family," she said. It was a sentiment echoed across the board throughout the game; friendly rivalries aside, each acknowledging each other's sacrifices. Former Police Superintendent Garry McCarthy and 41st Ward Alderman Anthony Napolitano, who served in both the police and fire departments, were rooting from the sidelines. "We lost two incredible men, two heroes, and all these guys know it," Napolitano said. "This is a rivalry but it's a camaraderie at the same time. They love each other. They're going to hit each other hard but they're going to bring each other up and at the end we're all brothers and sisters." "I said my condolences to the fire department team when I came on the field and said hello to them for their loss," McCarthy said. "We're still hurting over Paul Bauer. I don't think that's going to go away for a long time." In the end, despite a strong start by the CFD Blaze, who scored in the first few minutes of the game, it was not meant to be. The CPD Enforcers took home the title for the second year in a row, 31-20.